Want a way to cure your phobia? The Boldrini Spider is a hybrid slipper and velcro shoe designed for technical performance on all types of climbs. The Spider has the suppleness and sensitivity of a ballerina shoe combined with a subtle velcro closure to provide a firm and secure fit on longer climbs. Formula Rubber Enduro is Boldrini's harder compound, designed to be more durable and to work better on edges, which is complemented by the downturned profile and asymmetric last. This combination of suppleness, stability, and precision make it a great shoe for varied sport climbs. Entirely made of microfibre, the Spider requires no breaking in and will maintain its performance shape over its entire lifespan. Perfect for the climber seeking all-round performance and versatility, the Spider has everything for all types of climbs with a durability that will go the distance. For anyone looking into boldrini shoes who is English - these shoes are extremely narrow and for people with small feet. Anyone with average feet will be just fine, but an extremely narrow heel, combined with narrow overall width, a non stretchy upper, and a low, short closing system means it isn't suitable for anyone with above average feet. However, the rubber is grippy, shoes are great for edging. 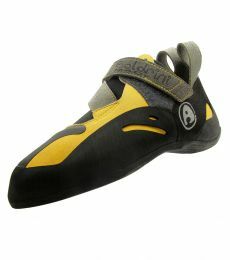 I hope to get them broken in as these perform well for anything, bouldering, sport climbing.